Bill De Blasio Wins New York City Mayoral Election : It's All Politics Democrat Bill de Blasio won the New York City mayor's race, defeating Republican Joseph Lhota. He became the first Democrat to win the office since 1990. 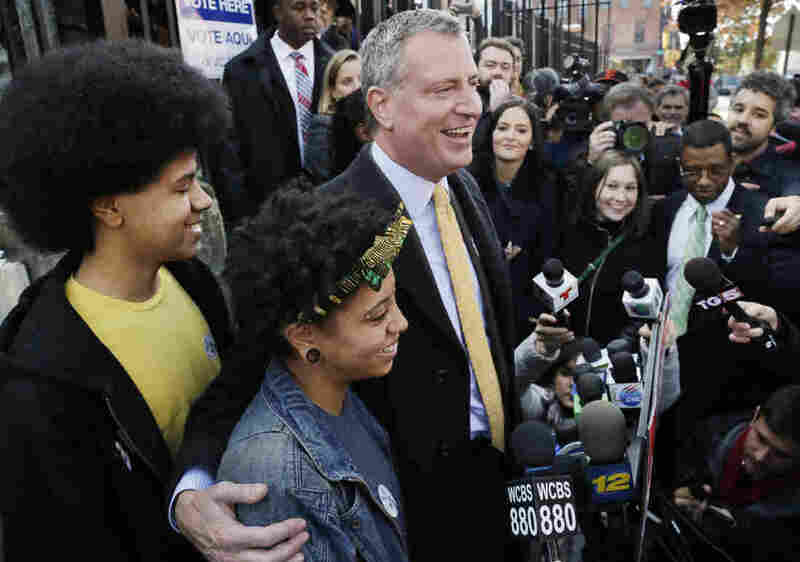 Democratic mayoral candidate Bill de Blasio with his daughter Chiara and son Dante as he talks to the media in Brooklyn after voting, Tuesday, Nov. 5, 2013. Democrat Bill de Blasio won the New York City mayor's race, defeating Republican Joseph Lhota. He became the first Democrat to win the office since 1989. The Associated Press declared de Blasio the winner about 45 minutes after the city's polls closed at 9 pm ET. De Blasio had what appeared to be an insurmountable lead in polls heading into Election Day. The election of de Blasio, an unabashed liberal, marked a definitive end of the Mayor Michael Bloomberg era. Bloomberg, the billionaire capitalist who led the city for three terms was seen by many New Yorkers as a friend to Wall Street and big business but less concerned with the plight of low and middle-income New Yorkers. Bloomberg was also seen by many New Yorkers as a Manhattan-centric mayor who ignored the needs of the four outer boroughs. De Blasio, by contrast, promised to focus his policies on the New Yorkers he accused Bloomberg neglecting during his tenure in City Hall. He singled out issues like income inequality, affordable housing and education for particular emphasis.